Home » unclog » The Clogged Ear Tube - How to Unclog It? The Clogged Ear Tube - How to Unclog It? 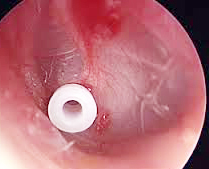 Once the decision has been made to place ear tubes for one reason or other, typically for chronic ear infections, eustachian tube dysfunction, or serous otitis media, the ear symptoms resolve until either the ear tube prematurely comes out... OR the tube becomes clogged usually with earwax, very thick mucus, granulation tissue, or dried debris. After all, the tube works by allowing ventilation between the middle ear space and the ear canal. With a clogged ear tube, this communication gets cut off and the situation reverts to the way things were before the tube was even placed. So what to do other than physically removing the ear tube and replacing with a brand new tube? If granulation tissue is present, I typically try steroid containing ear drops, typically ciprodex, cortisporin, tobradex, etc. The steroid often will cause the granulation tissue to involute and disappear with time. If particularly exuberant granulation tissue is present, gelfoam (dissolvable sponge) can be placed right over the granulation tissue prior to initiating ear drops. The earring is on the tragus. If very thick mucus is present, I typically try to suction the thick mucus out of the tube's opening. Sometimes, it is SO very thick that even direct suctioning is unable to dislodge. In this situation, one can again try ear drops as mentioned above with aggressive tragal pumping to try and "dilute" the thick mucus to enable it to drain out properly. The other type of ear drop that has been perhaps just as helpful in this situation is soapy water... I typically instruct patients to fill a one ounce eye dropper with distilled water followed by one drop of no-tears baby shampoo. It is worth reiterating that ear drops will NOT work unless aggressive tragal pumping is also performed after the drops are placed. Tragal pumping is performed by pressing the tragus against the opening of the ear canal repeatedly several times. This maneuver forces the ear drops down into the ear canal where the clogged ear tube is located, otherwise the drops tend to float in the ear canal without really reaching the tube itself. With dry debris or earwax, the first thing to try is manual removal, assuming the patient can tolerate. Removal is performed using micro ear instruments under a binocular microscope. One can either remove through the ear canal... OR push the debris through the ear tube where it can fall into the middle ear cavity. If removal not possible, one can again try ear drops with aggressive tragal pumping. • Prescription ear drops with or without steroids, typically ofloxin, ciprodex, cortisporin, cipro HC, etc. The reason why there's pain and risk of damage is because once the ear tube unclogs, the ear drops can now traverse the ear tube and into the middle ear space. The middle ear space is very sensitive and such substances can trigger severe pain/burning (kind of like alcohol on an open wound). Tube that is open without any clogging. Should the drops still be used if the eardrum is perforated? 2year old had a new set of tubes placed Monday, and now had perforated ear drum and blocked tube in same ear.